He organized the first Presbyterian churches in Wyoming, Montana, Utah, Arizona, and Alaska (leaving 77,105 new communicants in his wake), and he started 53 schools in Alaska. He founded Westminster College in Salt Lake City in 1895, started two newspapers (the Rocky Mountain Presbyterian and Sitka’s North Star), and organized an Alaska Society of Natural History and Ethnology in Sitka. Sheldon Jackson College (Presbyterian), also in Sitka, bears his name. "I have never seen him idle for a moment,” wrote fellow traveler Alice Palmer Henderson. “He never hurries but just persists.” Even through setbacks—poor health, one arrest and two legal trials—he persisted. 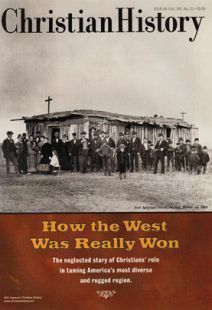 Sheldon Jackson ranks as perhaps the most remarkable and controversial American missionary in the last half of the nineteenth century. After graduation, he married Mary Voorhees and immediately applied to the Presbyterian Foreign Mission Board to go overseas. The board turned him down, claiming he was not physically strong enough, and instead asked him to teach Choctaw boys in the Indian Territory (present-day Oklahoma). After 12 months of unpleasant duties and three bouts of malaria, he resigned. His pioneering desires were fueled for a lifetime at a presbytery meeting in Sioux City, Iowa, in 1869. There, atop Prospect Hill, he had a vision of missionary service that spanned the West. Believing that the church must keep pace with the waves of people crashing westward, Jackson convinced the denomination to appoint him superintendent for Iowa, Nebraska, Dakota, Idaho, Montana, Wyoming, and Utah—some 571,000 square miles. (Iowa, Nebraska, and Dakota were soon assigned to other missionaries, while Colorado, New Mexico, and Arizona were later added to Jackson’s responsibilities.) Though there was no money to pay him or to fund construction of churches, he accepted the position and began touring by rail and stagecoach. Jackson and his family had lived on a meager income for years. Rather than complain, Jackson raised support by soliciting money from friends and fellow Presbyterians, much to the consternation of mission board officials. In his first two years as superintendent of the West, he raised $10,000 for the church-planting work. In his first year, Jackson started 22 churches and traveled 29,000 miles, primarily through Montana, Wyoming, Utah, and Nebraska. His journeys were long and arduous. He once spent four straight days and nights in a bumpy stagecoach, sleeping on a 4-and-a-half-foot board. Sometimes he rode with a shotgun on his knees for fear of Indian attack. According to his first biographer, friend Robert Laird Stewart, 12 revolvers once pointed at him during a stagecoach robbery, and, on another journey over the mountains, he had to jump from a carriage to escape plunging with it over a cliff. "If any have ever tried the torture, the living martyrdom," Jackson wrote, "of riding in a stagecoach from Monday evening to Sunday morning, day and night, without stopping except for a few minutes at a time to change teams—sometimes with three meals and sometimes with only one in 24 hours—and even that so poor and dirty that only hunger forced eating, then you will have some conception of the amount of physical fatigue and suffering that is crowded into those trips.” Nonetheless, he said he was “thankful for the privilege of laboring and suffering for Jesus.” By 1877 Jackson had traveled 212,000 miles, organized 67 congregations, and built 36 churches. Soon Jackson’s heart began beating for new fields—the neglected tundra purchased for $7.2 million, Alaska. Early in 1877, an army private stationed in Wrangell (about 100 miles south of Juneau) wrote his major a letter that was passed to a Presbyterian minister in Portland, Oregon, who passed it to a friend going to the Presbyterian General Assembly in Chicago. The friend passed it to Jackson, who was moved by it and had it published in The Chicago Tribune. Alaska had no civil government, no enforceable laws, and no public education system. Congress had ignored the new possession, leaving a few United States military men to keep order amid brothels and bars. As a result, about 30,000 natives found themselves worse off under the Americans than they had been under the Russians. Jackson visited Alaska anyway. Though the board was not pleased, it eventually approved his new venture-after another man refused the assignment and Jackson said he would raise his own funds. From 1877 to 1884, Jackson delivered 900 speeches across the contiguous United States in a crusade to introduce order, legal and moral, to Alaska. He went everywhere-except his assigned territory in the Rockies. The home mission board was forced to relieve him of his responsibilities in the West (except for New Mexico and Arizona) because Presbyterians there complained about his continual absence. Are our souls worth less than Alaskan souls? they asked. Freed up to focus on Alaska, Jackson broadened his efforts beyond establishing churches. In April 1885, the federal government appointed him the territory’s general agent of education, responsible for setting up a system of schools for whites and natives. The task was practically impossible. Only 2,000 of the 36,000 Alaskans spoke English, and the government allocated a meager $25,000 per year for the project. A complete lack of infrastructure, a dearth of teachers, extreme weather, and a population uninterested in formal education further impeded Jackson’s work. Jackson’s biggest problem was Alaska’s corrupt government, which had been established in 1884. Instead of curtailing the sale of liquor to native Alaskans, officials greedily helped promote it, with destructive results: at least three villages starved to death because their men were too drunk to hunt. Officials also did little to stop the exploitation of native women or the Inuit practice of selling children into slavery. Jackson, having "little sympathy for fellow Christians who left the narrow way," actively opposed the magistrates. They, in turn, had him arrested for an array of offenses, including building a road that partially blocked access to an Inuit burial ground. Jackson fought back by informing influential people, including President Grover Cleveland, of his accusers’ incompetence and immorality. He wrote that one political enemy was “vulgar and obscene in his conversation, low in tastes . . . a gambler and confirmed drunkard, with but little knowledge of the law.” Cleveland quickly replaced the administrators, and though a new judge exonerated Jackson, the indictment forever marred his reputation. Despite these setbacks, which Jackson described to his wife as “very, very hard,” by 1893 Jackson had started 17 government schools in Alaska, including some for whites only, and 14 contract schools that were supported by a variety of denominations. Total enrollment reached about 1,800. Jackson’s last years were plagued by investigations into his mission activities. In 1899, a grand jury led by former Alaska governor Alfred Swineford (who once described Jackson as “dictatorial, arbitrary, untruthful, and a persistent mischief maker") charged Jackson with falsifying education reports. Jackson’s inattentiveness to the few white schools in southeastern Alaska (due to his efforts among Arctic natives) did not help his case. Nonetheless, he was not convicted of any wrongdoing. He was re-investigated in 1905, this time for establishing deficient schools and for mismanaging a reindeer ranching program that was designed to help the Inuits become self-sufficient. Though Jackson was an imperfect administrator and a poor bookkeeper, he was acquitted of dishonesty or malfeasance. However, one charge stuck: his critics’ complaint that the general education agent’s salary was partially paid by the Presbyterian home mission board. The financially strapped Interior Department had asked the mission board for help in 1888, so Jackson was a missionary while he worked for the government. This had never been a problem, as both the U. S. president and the governor of Alaska were Presbyterians, and the federal government had regularly partnered with mission groups for work with native Americans (many of the schools Jackson founded with federal funds were run by missionaries). After Jackson’s case, though, the church-state connection had to be reconsidered. By 1900 the 16,000-mile annual round trips were taking their toll on Jackson. He turned over his work in northern Alaska to an assistant in 1901, and he made only two more trips to southern Alaska before an illness in 1903 kept him home permanently. He did not resign, however, until 1908, the year his wife died. The great missionary died the next year. Randy Bishop is assistant editor of Christian Reader and Your Church magazines. The ordeals of a missionary.